Never again will I leave my video camera where Cory can find it. Yesterday, John knocked off 4-timer Elliot Yates, after he secured a crush on the last clue; today, he gave away the crush, missing the penultimate clue. Evan made two solid Daily Double wagers that didn’t work out for him; fortunately, he left off 200, so he gets to play Final. We’ll look only at John and Verna. If Verna doubles her score, she’ll have 26,800. 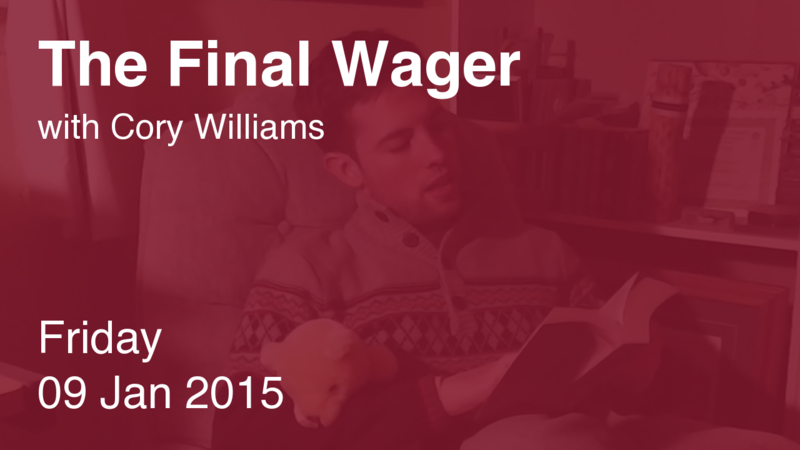 To cover this all-in wager, John will need to wager 7,000. An incorrect response with that wager will leave John with 12,800. To stay above his total, Verna can wager up to 600. 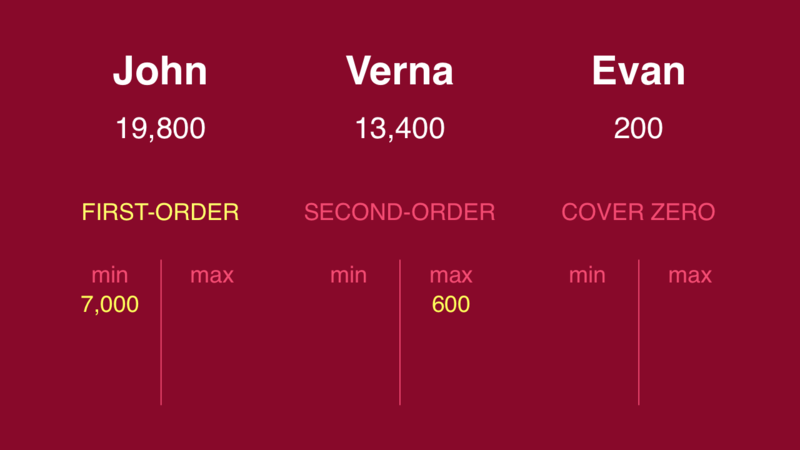 If Verna makes the rational maximum wager of 600, John can to wager 5,800 to stay above her. If he’s wrong with that wager, he’ll be left with 25,600. 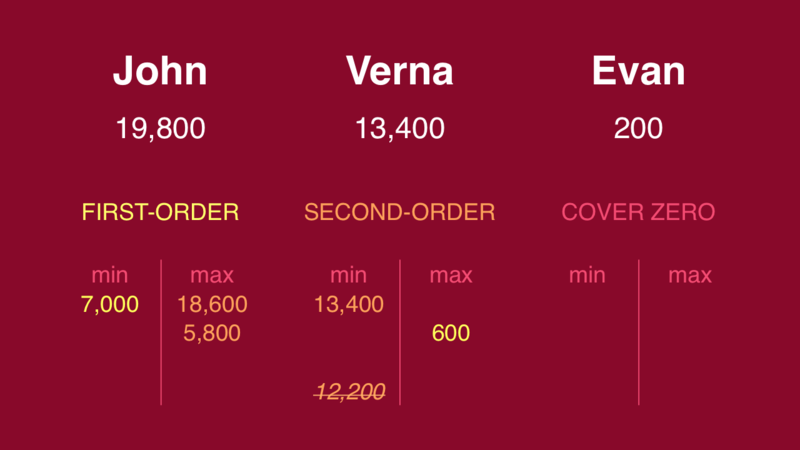 Verna would have to wager 12,200 and respond correctly; she might as well go for it all. I prefer that wager over the smaller one. 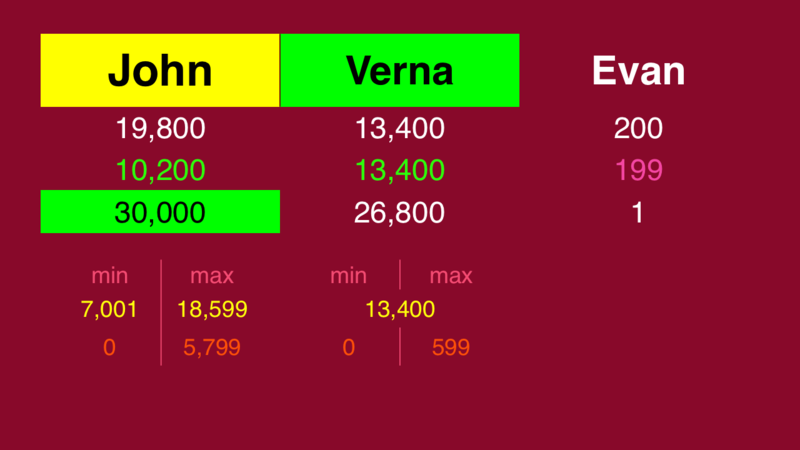 But if John‘s going big, and wants to gamble that Verna won’t do something irrational if they both miss, he can wager to stay above her highest potential final total (1,200). The 6,400 difference helps neither player, so we ignore it. If I’m John, I probably wager the bare minimum, but maybe he and Verna had been talking about wagering in the green room. Verna did everything right, but John took advantage of this, tacking on an additional $3,199. He’ll be back on Monday, looking to become our third straight 3-time champ. See you then! the last 10 games (counting tonight) in which we had three players in Final Jeopardy we have the following result: In 3 cases all three got it right = easy. 2 cases of 1 right + 5 cases of 2 right = 7 ok and 0 cases of 0 right = hard. So that’s a “final jeopardy degree of difficulty = just right” score of 70% and an “average degree of difficulty” score (higher is easier) of 2.10. The “no triple stumper on FJ” streak continues.